Slovenia is the perfect size for a honeymoon. Roughly as big as New Jersey, it's small enough to cover lots of ground, while still offering a wide variety of landscape and activities—and Ljubljana, the charming capital city, is a convenient base camp for day trips around the country. Ljubljiana itself offers an excellent culinary scene and plenty of nightlife, but the real adventure begins when you head out to the countryside. 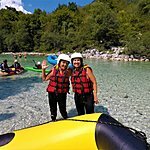 From kayaking on the Soca River in summer to hitting the slopes at the Krvavec Ski Resort, Slovenia is a perfect place for couples with an adventurous spirit all year round. 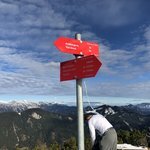 For more specifics on Slovenia's seasons, check out this article. Honeymooners should give themselves a week for a comprehensive tour of Slovenia, though its manageable size also makes it a great destination to combine with neighboring countries like Croatia and Italy. This article offers itinerary ideas for honeymooners looking to spend anywhere from 2 days to 2 weeks exploring the country. For the ultimate fairytale ending, why not make start with a fairytale wedding? 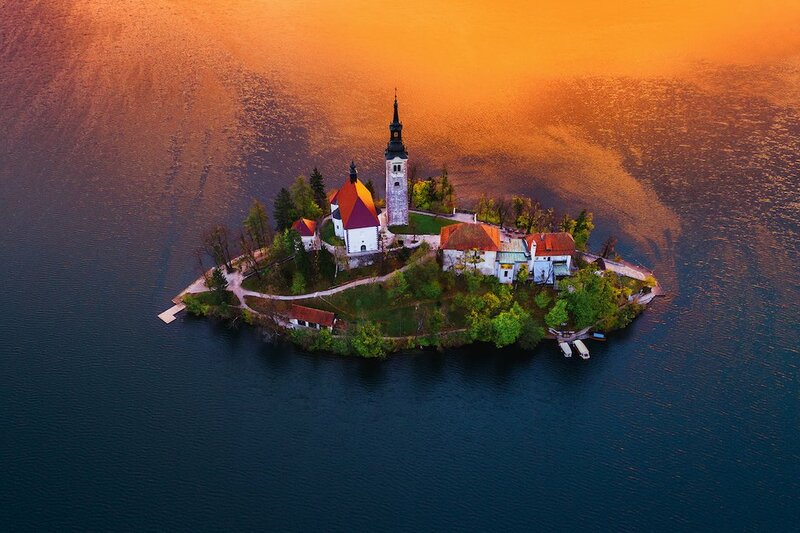 There are few places dreamier to tie the knot than Lake Bled, and once you're done celebrating your union (and taking absolutely epic wedding photos), you'll be in a prime jumping off point to tackle the rest of this list. Like something dreamt up by the Brothers Grimm, on a lone, picturesque island in the heart of Lake Bled sits the Church of the Mother of God. It's tradition for the groom to carry the bride from the pletna (a small wooden boat used in Bled), all the way up the church's 99 steps to be married. Once the ceremony is over, the new couple can keep climbing to the top of a 150-foot bell tower (consider it a leg day—whew!) and ring the church bell three times for a wish to come true. Access to the church is available all year, so long as the lake isn't frozen over. After the festivities, head back to the mainland and hop on a horse-drawn carriage to begin your happily ever after. With rolling hills, a lush landscape and plenty of sunny days, one of the best ways to discover Slovenia's surprisingly vast wine culture is on two wheels. You'll find fall and late summer to be best for a cycling tour—you'll avoid the heat and crowds that mark the peak high season months. While Slovenia's best-known region might be Primorska, two more of Slovenia's major wine regions, Podravska and Posavska, can be found on the eastern side of the country, bordering Croatia and Hungary. In Podravska, Slovenia's largest wine-producing region, you'll find mostly dry whites, sparkling and dessert wines using grapes like Riesling, Sauvignon Blanc, and Pinot Noir while Posavska is best known for their particular unique and slightly sour variety, a low-alcohol predominantly red wine called cviček. 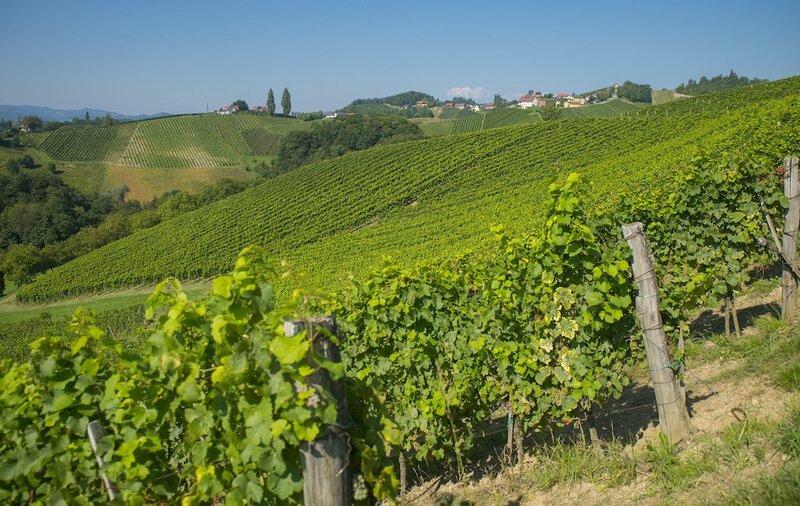 The northeastern wine region of Styria is another great option for biking—you can cruise through the lush fields of Ptuj, along the banks of the Drava river, and down the Malečnik wine road to Maribor. Couples hoping to stay overnight should consider Chateau Ramšak: situated on nearly 40 acres, travelers can glamp (or stay in a treehouse!) and wake up to vineyard views before enjoying wine tastings, massage, and a private hot tub. 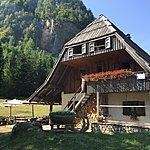 For more unique lodging options in Slovenia, look here. No matter if it's winter or summer, one of the most relaxing ways to enjoy Slovenia is to take full advantage of their sauna culture at one of the country's many spa centers. With an abundance of clean alpine water and thermal hot springs, Slovenia's spa heritage dates back to Roman times. So the question isn't whether to go to a spa, but instead—which one? For those looking to relax and pamper themselves, try Terme Olimia. 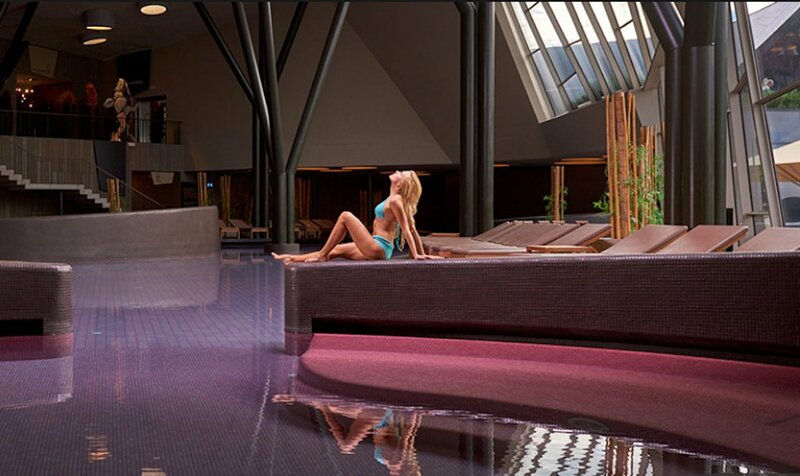 Located along Slovenia's eastern border, Terme Olimia was designed to be in harmony with its surroundings and features Wellness Orhidelia, an adults-only luxury spa featuring indoor and outdoor pools, spas, and plenty of packages and treatments for you and your bae. If you prefer a spa that heals both inside and out, try Zdravilišče Radenci, which is known for the healing properties of its CO2-rich mineral water. Not only does this spa feature ten pools, a thermal water park and traditional services, but it even has it's own health center specializing in cardiovascular rehabilitation. Healthy relationships start with shared experiences, and few are as exhilarating as exploring Slovenia's underground. 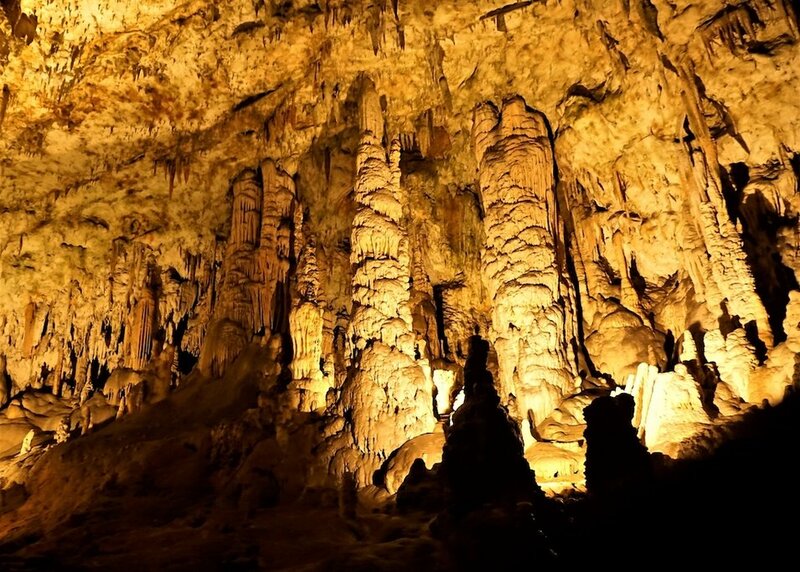 Postojna is Europe's most visited cave system for a reason. Located in the Karst region, Postojna is nearly 15 miles long and best known for their olm, or "baby dragons:" reclusive, eyeless amphibians that live exclusively in the waters of the cave. You'll also find a nearly 50-foot-tall stalactite nicknamed Skyscraper and Renaissance-era Predjama Castle, built directly into the mouth of the caves. While the Postojna Caves might be the most visited, the Škocjan Caves also genuinely impress. A UNESCO World Heritage Site, the Škocjan Caves feature cavernous rooms with giant stalactites and stalagmites and the largest subterranean canyon in Europe at over 400 feet high. Carved out by the Reka river, the cave system also features dozens of waterfalls. As these caves are located many feet underground, they remain roughly the same temperature all year long so consider either one an experience you can share any time. Ljubljana is a scenic medieval city with a handful of famous bridges. There is the Tromostovje ("Triple Bridge") connecting the new, modern city with the old town, or the Dragon Bridge named for the four statues that sit guard. 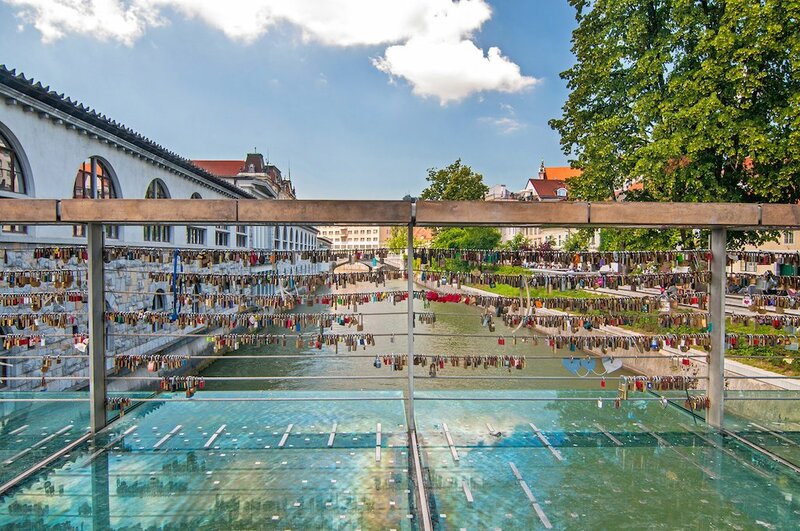 But for lovers, take a quick walk from Preseren Square to find Butcher's Bridge, where it has become a sweet custom for couples to engrave padlocks and lock them to the bridge. Traveling here in December? Take a romantic stroll through the Ljubljana Festive Fair afterward while sipping on mulled wine. Head out for a romantic dinner in Ljubljana to see Slovenia's burgeoning culinary scene for yourself. Try Strelec, a restaurant located in the archers' tower of Ljubljana Castle—it offers contemporary Slovenian cuisine in a Roman and Medieval setting, and the views over the city do not disappoint. Or make a reservation in the courtyard at Špajza, located along one of Old Town's most photogenic streets, and sample seasonal fare inspired by traditional Slovenian menu items—think veal medallions, venison tartar, and octopus over truffled potatoes. Altrokè is another elegant option. This wine bar and eatery in the heart of Old Town has outside seating on the charming, cobbled street or under the brick ceilings of the hip interior. 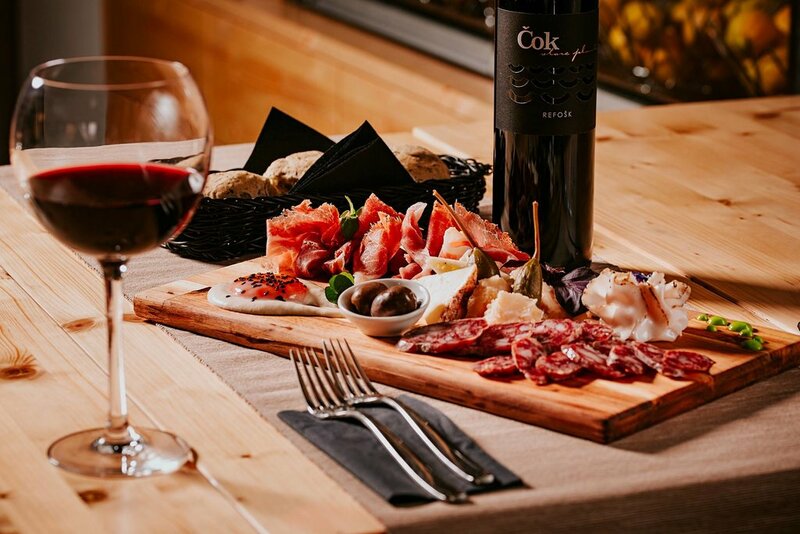 Owned by a Slovenian winemaking family, expect an extensive local wine list and food menu focused on Istrian coastal cuisine. Need more Slovenia honeymoon inspo? 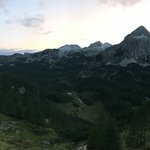 Check out more of the best things to do in Slovenia, and consider adding a few authentic local experiences to your itinerary.